Founded in 2004, Grill’d is celebrated for its quality products and community-mindedness. However, Grill’d found its digital assets were not keeping up with the company’s rapid expansion. Website information was often out of date, and the site would crash following surges in traffic. 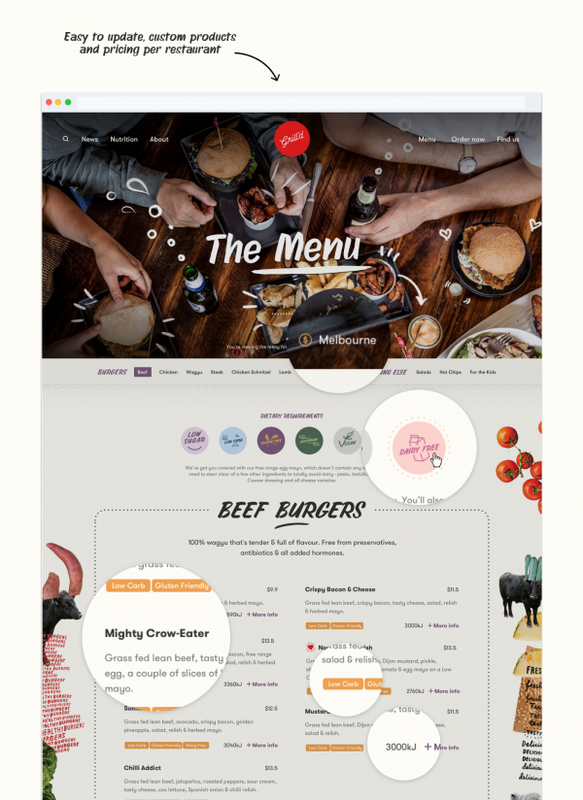 Eager to generate the same buzz around their digital presence as their physical product and in-store customer service, Grill’d commissioned us to develop a next-generation website alongside an agile, sophisticated platform to streamline business processes and support a variety of digital marketing efforts. The new Grill’d website has been exceptionally well received, not only by existing customers and Grill’d team members, but by those new to the brand, too. A well-designed sitemap and technically-friendly page designs contributed to a 12% year-over-year increase in organic traffic. Although we observed increased engagement across all site visitors, this lift was particularly evident amongst new users. Supported by a number of campaigns over the first three months following launch, website traffic grew by 32.6%, with a stable new vs. returning visitor ratio of 34%. Additionally, pageviews increased by 121.6%, bounce rate decreased by half, and average session duration doubled over the previous year. Taken together, these statistics suggest the new website’s content and structure is delivering true value, making the Grill’d brand more accessible and alluring to prospects. Thanks to our load-balanced hosting solution, the Grill’d website has maintained 99.99% uptime since launch. With 120 stores and more on the way, Grill’d is fast becoming Australia’s boutique burger of choice. However, like many businesses who experience slingshot growth, their website and associated systems hadn’t kept pace with the rate of expansion. The national burger chain enlisted us to develop a vibrant, engaging website that would deliver lightning-fast responses and support high traffic. They were also seeking a platform to manage digital marketing, drive customer engagement, and streamline business processes. The existing website lacked the capacity to handle high-volume traffic, and information was often out of date, creating a user experience that was incongruent with what customers experienced on arrival at one of the chain’s 120 locations. 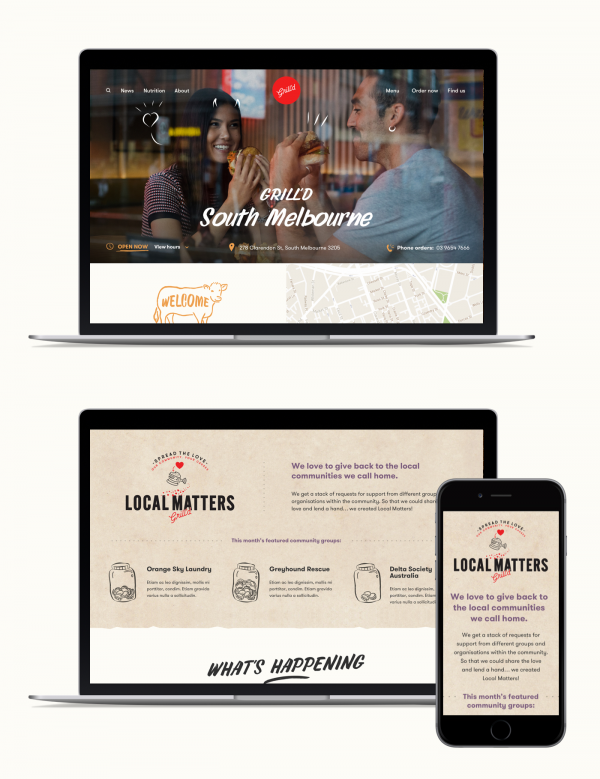 Grill’d engaged us to design a website that would not only encapsulate its healthy food philosophy and commitment to community, but also serve as a one-stop-shop for customers to access brand and product information with ease. Grill'd required the development of a new website platform to form the centrepiece of a digital transformation program over a 12-18 month horizon, aimed at increasing awareness, delivering a better and more rewarding experience for Grill'd's existing and prospective customers, and enhancing Grill'd's customer insights through data acquisition. 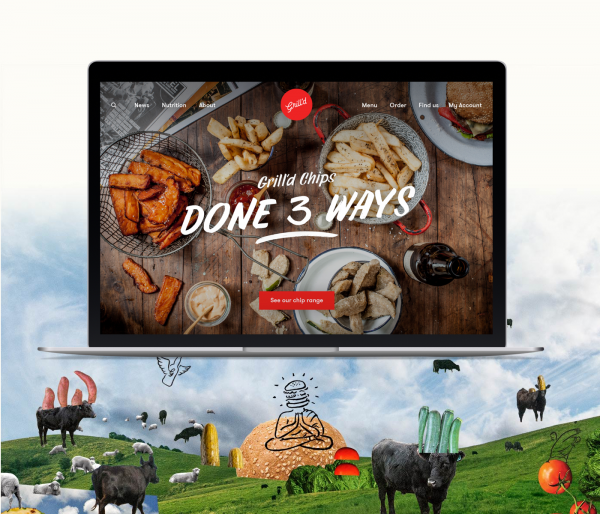 From the beginning, the core objective of this collaboration was to deliver a website and digital platform that adequately represented the Grill’d brand and mimicked the same kind of warm, welcoming experience customers enjoy when visiting a Grill’d location. The Grill’d philosophy is all about what’s good: ethical sourcing, community engagement, and healthy, whole foods. We knew the website had to be good, too—a one-stop-shop for customers to easily access brand and product information. 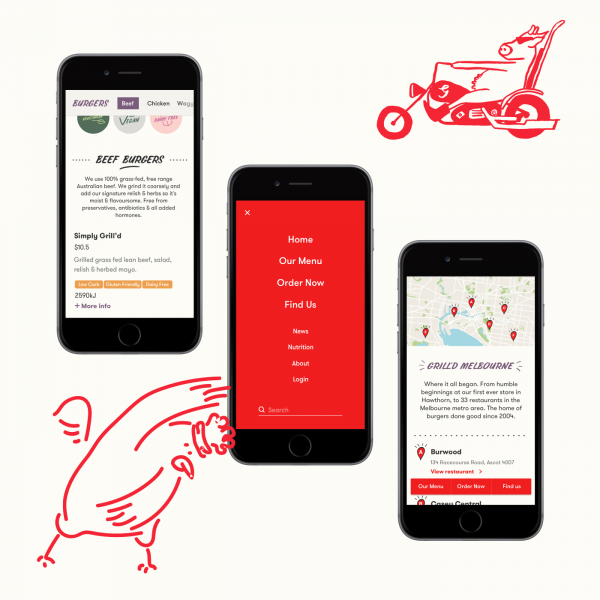 To create an experience that resonated with customers’ needs, we hit the streets to do some hard-hitting UX research and chat to Grill’d customers. We learned some invaluable insights about what customers expect from a retail site and how they respond to different features and components. 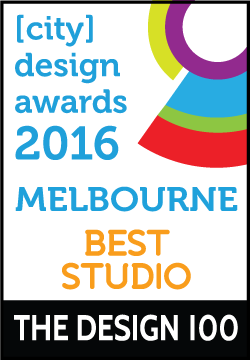 Grill’d customers are primarily focused on two things: browsing the menu, and finding their local Grill’d restaurant. These objectives became critical user journeys and part of the website’s A-level navigation, warranting special treatment across all devices. With a single click/tap, users can jump from any page to the menu (complete with pricing, ingredients, and nutritional information) or to a user-friendly restaurant locator. 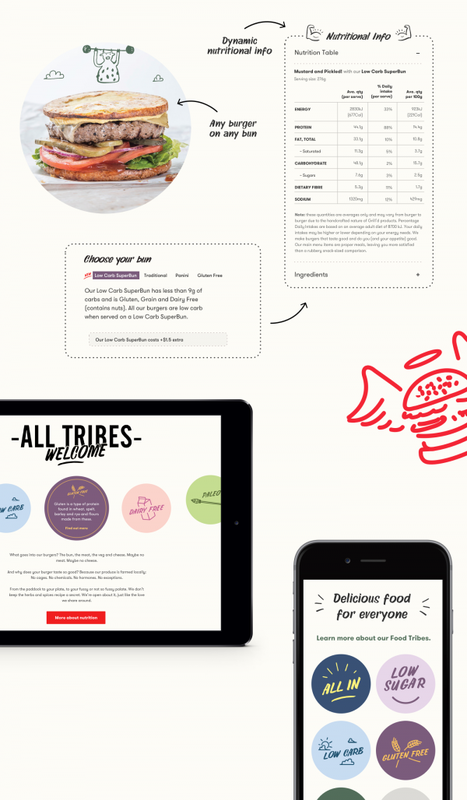 Given the rise of vegetarianism and veganism in Australia, we also elected to feature “food tribe” and nutritional content prominently on the site. In addition to a homepage feature, we created a dedicated overview page and special controls on the menu page to understand how Grill’d fare can be made to suit all kinds of dietary restrictions and preferences (gluten-free, dairy-free, low-carb, and so on). To deliver on this objective and in light of the many-layered complexities of this particular website, we opted in favour of advanced analytics and custom measurements beyond those normally available through Google Analytics. Deployed through Tealium, our measurement plan delivers advanced insights, and the custom tracking setup helps us understand which sources drive highly-engaged customers, how customers interact with the site and functionality, which products customers prefer, and additional insights to identify audience segments. At present, the Grill’d site currently has no facility for users to be logged in, or private information shared. With on-site tracking through Tealium and Google Analytics, all recorded data is anonymous.